With Titan Roof Systems, composite roofing products have attained new heights. Titan Roof Systems offers some of the most innovative products to hit the composite roofing market. With its revolutionary multi-coloring process that allows for unique color blends within each barrel tile, piece of slate or shake, Titan’s products are unrivaled. Titan Old World Spanish Tile, Titan Old World Slate, Titan Slate, and Titan Shake are manufactured with recycled material. All of Titan Mfg roofing products are fully sustainable. Titan Old World Slate is the thickest composite slate on the market with a 1” profile. 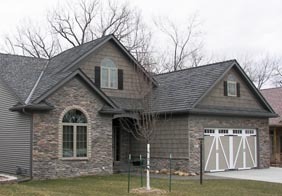 Old World Slate replicates the look of thick, heavy, natural slate without the need for added structural support or the high labor costs associated with installing natural slate. Titan Shake is available in three different widths to provide an authentic cedar shake appearance. The shake varies in thickness from 5/8” to 7/8” adding depth and true- to-life hand split texture. Unlike natural cedar, that has narrow pieces that can break and must be discarded, the durable construction of Titan Shake assures very low breakage during shipping and installation. Titan Old World Spanish roofing tile will assist in achieving the special aesthetics you desire for your commercial roofing project or exquisite residential endeavor. Not only is it Class 4 hail rated, but the lighter weight composite roof tile is easy to install and provides the realistic appearance of clay tile without the added weight and breakage concerns.